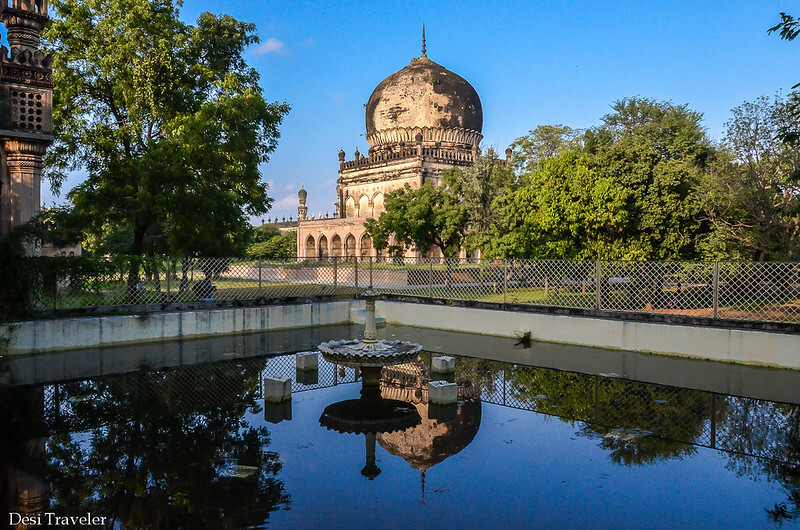 This weekend I once again visited the 7 Qutub Shahi Tombs, where 7 generations of the Qutub Shahi Emperors are resting. 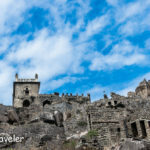 The tombs are on the way to Golconda fort but are normally given a miss by most of the visitors, who are happy to visit only Golconda Fort. 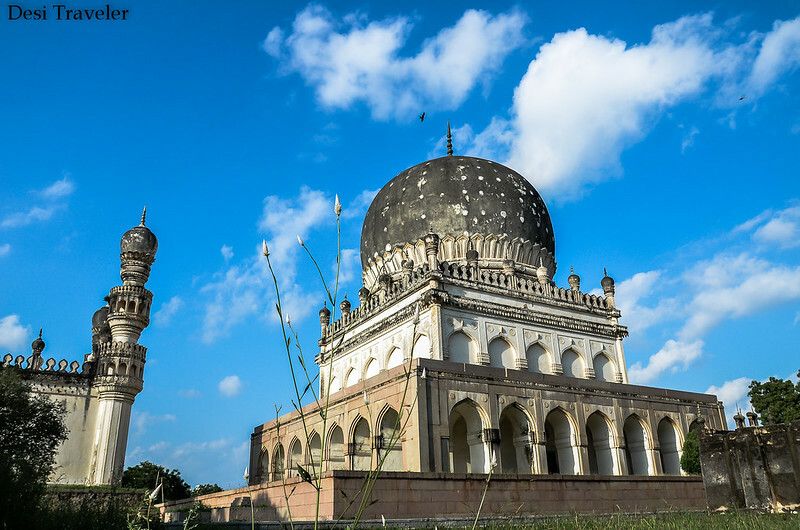 The tombs were built by successive generations of the Qutub Shahi kings as their final resting place. There is even an unfinished tomb which could not be built due to political disturbances. This time when I visited the tomb my aim once again was to catch some action during the sunset. Hopefully, I have been successful. The tombs are surrounded by a densely populated residential area with the green coverage slowly being gobbled up by growing concrete jungle. 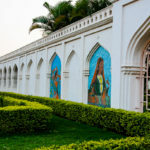 You will find a lot of families from nearby areas coming there for a picnic and playing in the shadow of the majestic tombs which stand taller than a multi-story building. Each tomb is unique and though look similar once you start looking at them closely you realize that each one has finer details different from the other. Besides the tombs of the kings, you will also find tombs of other members of royal family and some ministers also. While looking at the tombs I was wondering looking at all the people playing around, enjoying their snacks if any one of them realizes that we are actually inside a Graveyard, a Royal one but still a graveyard. 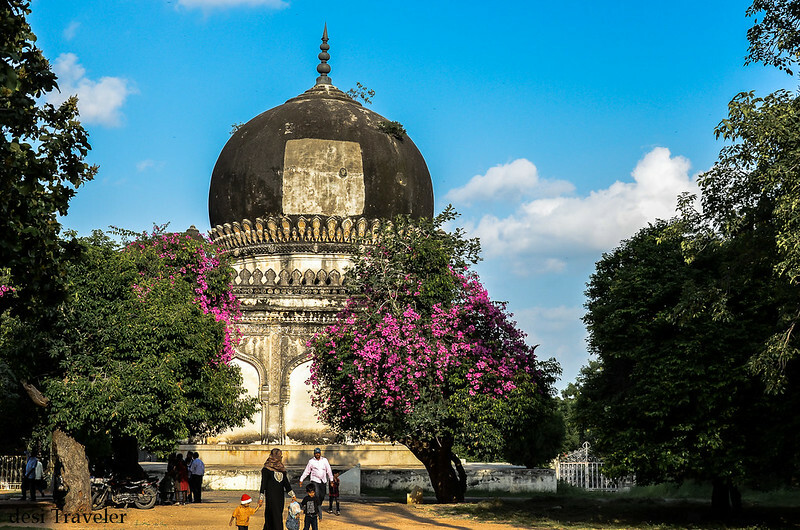 Such is the beauty of the majestic Qutub Shahi Tombs that you forget you are surrounded by graves, and you simply start enjoying the moment. 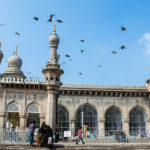 Besides the tombs, there are 2 mosques inside the complex and true to the multicultural heritage of Hyderabad a small temple dedicated to mother goddess is situated right in the middle. 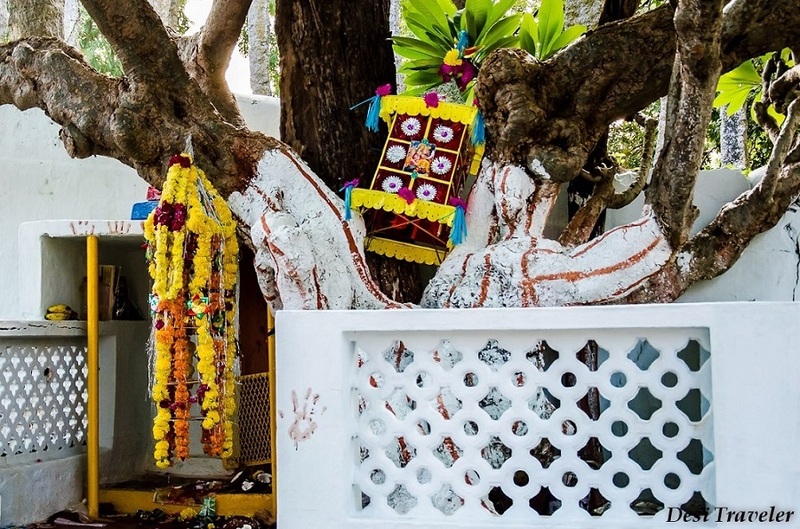 Last time I found some Bonalu offerings on the temple, but this time the step well and the temples were closed for some maintenance work. 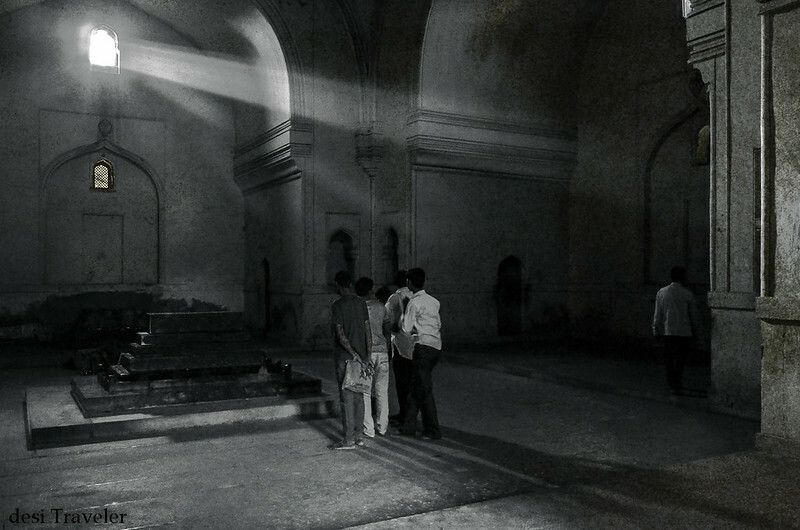 I also tried taking some pictures of light entering through the vents inside one of the tombs have a look at this picture below. Not a very good one, but I was still happy as it was shot blind without using a tripod or looking through the viewfinder. I just kept my camera on a small shelf in wall praying that I will get a good shot. Not a very good shot but still sharing here for your inputs. 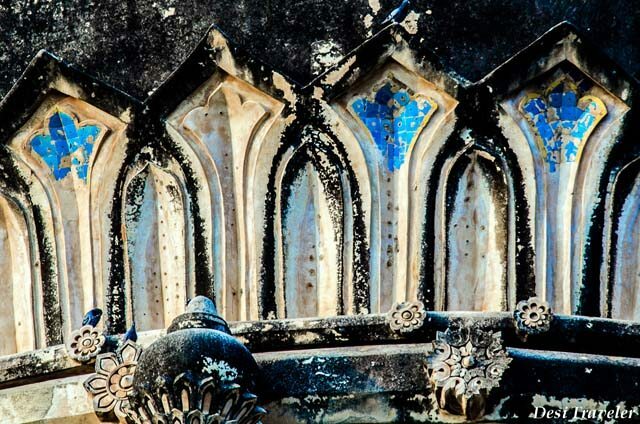 Maybe the Blue Tiles are of Central Asian origin/influence? 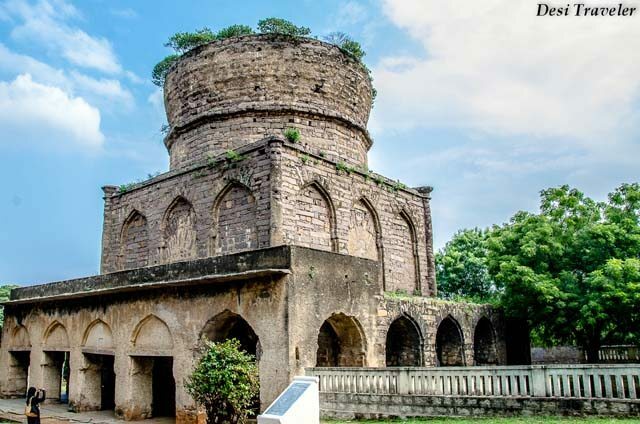 How to Reach Qutub Shahi Tombs: While going to Golconda fort take the Qutub Shahi tomb road from the CR Road, the tombs are just after the Masjid E Abdullah Qutub Shah. They are visible from a distance though I am sure in a few year will be dwarfed by all the high-rises coming around. If you are asking locals for directions also say you want to go to 7 Tombs Toli Chowki as the area nearby called by old timers. Photography is allowed by paying a camera fee of INR 20. 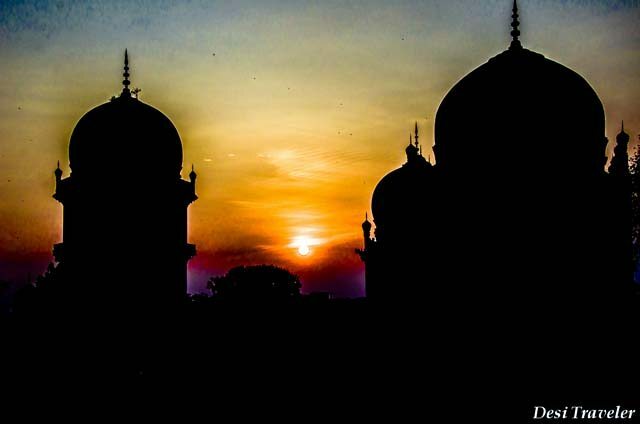 Around 3 pm in afternoon, this way you can explore the tombs and then click some good sunset pictures of Qutub Shahi Tombs. 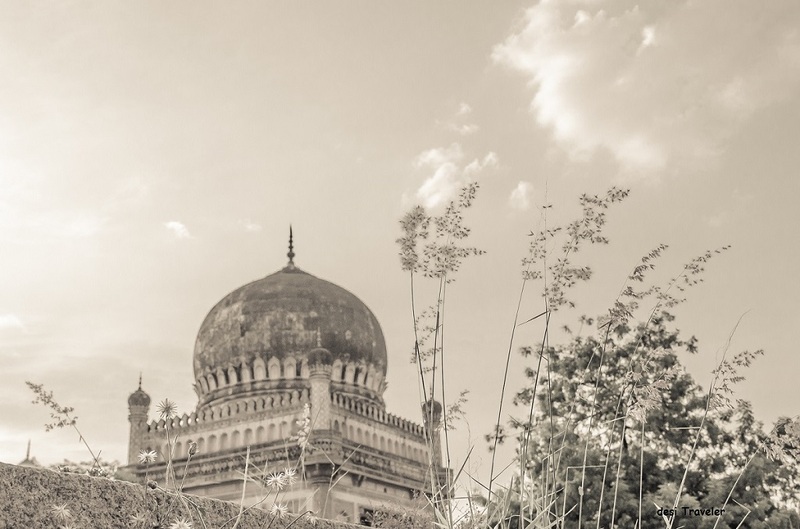 This post is based on my second visit to Qutub Shahi Tombs, the first one appeared on Ghumakkar, some pics may have been used again. All pictures for this post taken using Nikon D7000, 18-105 lens. 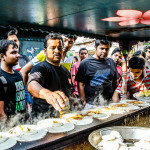 Also, check this list of places to see in Hyderabad and nearby. If you have liked reading the post please feel free to subscribe by email and like it or share it on Facebook, LinkedIn, Twitter, and Google+. been to a see a few places for sure spent 4 weeks there , the charmina and the churi bazaar and Tank bund and the huge iskcon temple I think if i am not wrong..
Well most of the city has changed…specially the IT hub area.. I am yet to visit Hyderabad. It is due for long, long time. Let see, how early I could do it. 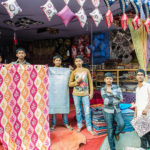 A great post and wonderful photographs. However, I read your post about the same place at Ghumakkar too, though that was a different story. Very Very charming post. Thanks Prasad! 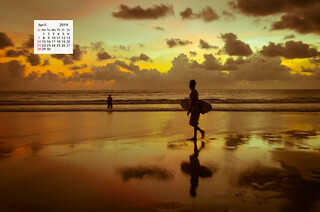 Very nice photos Prasad! I have been there once and being there at sunset (or sunrise?) seems to me to be a fine time for great light. Lovely! It is a pride of place for Hyderabad. There is one magnificent tomb, opposite Boats Club, at the beginning of Tank Bund. I always thought it is a pretty building. Your camera will capture its beauty perfectly.Only problem is, one needs to focus, on Sunday afternoons when the traffic is less on that imp. road. I have heard, but never been there, will plan one of these days… Thanks. I had went twice but I missed visiting the tombs. I am quite fascinated to visit this place.